The idea for this cover no doubt sprang from the antipathy of a middle-aged man who shared with most men and women of his generation a nervous fear of the youthful rebellion that was unfolding in America in 1969… or as I like to call it, the psychedelic music scare. It was left for writer Frank Robbins to turn it into a Flash story and he decided to pass. Julie Schwartz’s covers were alway tricky things for writers John Broome and Gardner Fox to twist into their stories, but, with this cover, writer Robbins barely tries. 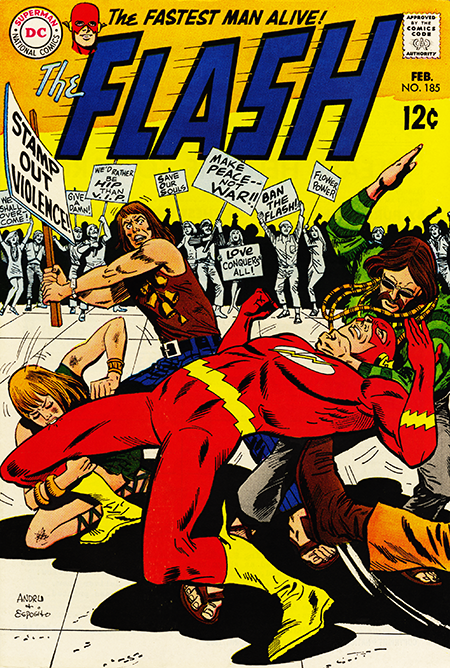 Yes there is a mob scene in the book, but the protestors aren’t protesting the Flash or war. They’re protesting the treatment of aliens (how timely) from outer space. Which brings me to another reason why I wasn’t enjoying these stories so much. Yes the Flash had dealt with space aliens before, but too many of the recent stories featured the Flash battling bug eyed monsters in a stereotypical and hackneyed fashion. Somehow the Flash’s previous encounters with BEMs always seemed a bit more elegant. These new stories just seemed like the stories in the other books that DC published (yes, Batman, I’m talking about you) which I cared for not a whit. Sadly, this was where the Flash seemed to be headed. Missing to a large extent was the interaction between the Flash and his interesting coterie of villains, as well as the more finely drawn characters such as Dexter Miles or Daphne Dean. In its place we have pretty standard stuff that failed to capitalize on the rich backstory that the previous writers had built. It was as if no attention was being paid to what had gone before, and, to cop one from Arthur Miller, attention must be paid. Reading these issues again merely confirms what I had felt the first time I encountered them… that they were the nadir in the publishing history of one of my favorite characters. Few graphs, however, ascend in a straight line. There’s always a lot of zigging and zagging that goes on, and we were just in a bit of a zag with this work. Sometimes the only way forward is through, so we’ll just make that our plan.